If sightings, footprints, hearing calls and voices, footsteps, thumps, and branches being broken, or finding structures, gifts and glyphs were not altogether enough for our rational minds to be convinced that our Elder Brothers are walking with us, they leave some of the most precious gift there is for us to touch and carry: their own hair. It is a sign of trust and loving respect that is granted only to close friends and spiritual allies. 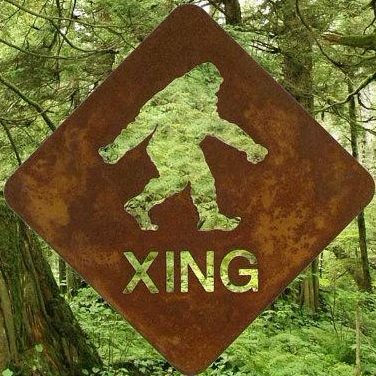 On last Full Moon, on the site of the 1st Spiritual and Psychic Sasquatch Conference (2016), we walked to the amphitheater in the woods where friends had just gone minutes earlier without noticing anything. I sat on the stage and right next to me was this piece of black shinny long hair, coarser than human hair but not fur, partly matted and braided, with a knot in the middle. My Elder told me it was a special gift to be shared with a few communicators he had already contacted. Some of it went to Australia with Brook and Leigh, some to Russia with Dr Igor Burtsev, some to Wisconsin with Jenny, some to BC with Patrick, with whom I saw Kamooh for the first time in 2003 on Vancouver Island, and some staying here in Chewelah with Kewaunee and Kelly, and with Bill at the Center where the gift was offered. I found hair three times during the last moon and was gifted more from other carriers. Brady also found hair from Kamooh and from his own Elder during the conference. There are several carriers of this sacred medicine. Kamooh has been visiting many Sasquatch communicators in the last year and gathering the clans with the other Elders who also take part in this cosmic convergence, visiting other communicators. He wanted to leave a clear sign that he was present there, as many other Elders from around the planet, as this new portal was opened. Thanks to our Elders and guides and to all our spiritual Family. Blessings to all our relations in the universal interdimensional circle. It was a blessing and honor to share the sacred pipe, drumming and chants in the sweat lodge with Dakota and Cree Elders from Saskatchewan and Manitoba. They were happy to hear about Sasquatch and to touch Kamooh’s hair on the pipe. Wonderful connections in this blessed day. I offered some bear roots I had picked to the medicine man and he said he had just been praying on the mountain this morning for bear roots. Weshared interesting stories and many songs. I didn’t take any photo at the lodge, so I googled this one, showing the Slocan River we swam in, with a view on sacred Frog’s Peak, taken from near where we did the ceremony. Tonight, a cougar walked across the backyard and stopped to look at me, very peacefully, and then walked away in the night.